After studying economics and psychology at Trinity College Dublin, and a career in the City of London, Peter McCann established the Life Anew Trust in 1981 alongside his wife, Dr Margaret Ann McCann. Life Anew was a charity that promoted Minnesota Model addiction treatment in the UK at a time when this treatment approach was virtually non-existent. 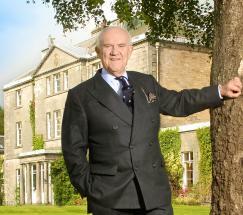 In 1982 Peter and Margaret Ann founded Clouds House, a drug and alcohol treatment centre in Wiltshire. After successfully running Clouds for five years when it gained an international reputation, they moved to Peeblesshire in Scotland where they in turn opened Castle Craig in 1988. Clouds, in partnership with its associated charities, has recently received the royal patronage of HRH The Duchess of Cambridge. Peter has presented at many conferences in the field of addiction, written papers on addiction and belongs to a number of professional organisations. In the early 1990s Peter founded EATA (European Addiction Treatment Agency) and five years ago Peter was elected on to the Board of the International Council of Alcohol and Addictions. He is an expert on cross-border EU Healthcare and is currently pioneering the use of hyperbaric oxygen treatment in addiction care.